Leave it to the British to put a hilarious twist on a creepy topic: zombies. 2004’s “Shaun of the Dead” puts audiences on the edge of their seats and has them laughing at the most suspenseful moments. In countless situations, Shaun and his friends find themselves confronted and sometimes trapped by massive hordes of zombies, yet through irony or pure luck they manage to escape – at least most of them. Shaun works at an electronics store in London. He is a 29 year old with a serious lack of motivation. His girlfriend Liz is always getting on his case, as is his stepdad who he hates. His best friend and third roommate, Ed, isn’t much better. The two spend hours playing video games in the house that they share with Pete, a highly motivated man who has nothing but disdain for lazy Ed. Pete routinely argues with Shaun for allowing Ed to remain. Shaun always comes to Ed’s defense because they are best friends, although he understands Pete’s concern. Just as Shaun decides to turn his life around, strange things begin happening to people all over London. At one point, Shaun and Ed run into a girl in their backyard who they take for being a drunk – but she has in fact become a zombie – and decide to joke around with her. After an incredibly gory accident in which she is impaled by a metal pole, they realize that something else is happening. As Shaun and Ed rush around London trying to save their friends, they encounter dozens more zombies. Sometimes to Shaun’s delight, the zombies manage to convert some of his disliked companions before he can grasp the severity of the situation. Throughout the movie, Shaun and Ed seem oblivious to most of the zombie attacks going on around them: a homeless man eating pigeons, a shockingly high number of car accidents and bodies everywhere on the sidewalks and streets. Irony and ignorance are abundant in typical British-style humor. The movie offers a well-thought-out critique of society as portrayed by the sometimes zombie-like actions of uninfected people in their daily routines. 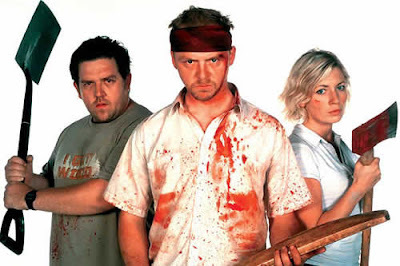 “Shaun of the Dead” is definitely a classic movie. Fans of zombie movies will appreciate the subtle jabs at the genre, while those who just like a good comedy will love the sometimes insane actions by the characters. The interaction is at times priceless, and the ending is never given away, leaving the audience glued to their set. The film will be screened on Cougar TV during the week of Halloween, but expect to stay up late, as it is shown at 11 p.m. on four separate occasions.